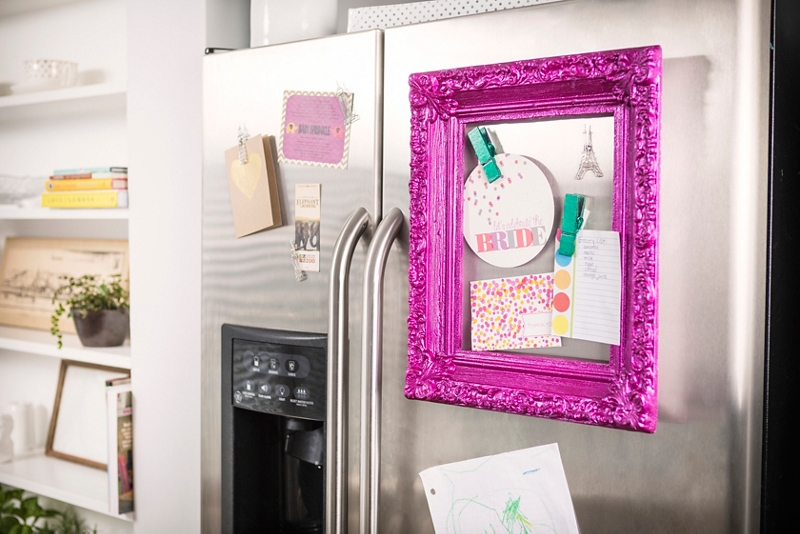 Organizing reminders and invitations is more fun with a colorful refrigerator frame! View additional Home Décor spray paint projects from Krylon®. On a covered surface in a well-ventilated area, prop up the craft foam frame at an angle using a cardboard box so that it is easier to spray. Spray the frame with Krylon Shimmer Metallic in Candy Razz. Please note, although Krylon Shimmer Metallic products are craft foam safe, the use of Krylon Craft Foam Primer is optional in order to achieve a smoother surface and a truer topcoat color. If using Krylon Craft Foam Primer, allow the primer to cure for 48 hours before top coating. Set the frame aside to dry completely. Meanwhile, lay wooden clothespins on a flat, covered surface. Spray with Krylon Shimmer Metallic in Candy Sour Apple. Once the frame and clothes pins are dry, use a hot glue gun to adhere craft magnets to the back of both the craft foam frame and the wooden clothes pins. Allow glue to dry completely before use. Once dry, hang the frame on the refrigerator. Arrange clothes pins inside frame and use to hold photos, shopping lists, invitations, and more!